I am proud to offer my first continuing education class! I have learned many things in the 10+ years I’ve been out of Acupuncture school; it is due time that I start sharing it with my community of peers. The main details of the class are in the flyer below. There is additional information about the class and my education experience below the flyer. Many know about the anti-inflammatory/cough relief/stress relief/skin moisturing/etc. properties of essential oils. Lesser known is that essential oils have strong resonance with different meridians and systems in the body. When using essential oils in the context of Chinese Medicine, we are combining herbal and meridian/acupressure therapy. Instead of having to digest herbs, you add the medicine directly to the imbalanced meridian. Meridians, senses and the spirit are all vibrated in the process. This causes an immediate shift in consciousness and provide long term, deep shifts in the body when used over a long period. In this class we are going to look at a number of essential oils through the lens of Chinese Medicine. We’ll take a look at the law of signature and let it guide us towards the actions and indications of each oil. We’ll learn a framework to assess an oil’s action on our own. We will then learn how to make blends for take home Acupressure therapy. In Classical Chinese Medicine, all of the meridian systems are important. There will be an overview of the different systems and their uses (Sinew Channels, Primary Meridians, Luo Vessels, Divergent Meridians, Extraordinary Vessels). For the purpose of our class, we will focus on Essential Oil therapy for the Extraordinary Vessels and Primary Meridians. Treatment of both physical and emotional manifestations will be covered. We will explore in depth the psychoemotional aspects of the disease and how to use essential oils for cultivation of spirit. Time will also be devoted to experiencing the essential oils. There will be a large amount of oils on hand to smell, sample and apply for treatment. If enough time is left there will be time to make personal blends to take home (take home blends are an additional cost). I discovered essential oils in 2006 upon graduating from Acupuncture school. I found a CD copy of a lecture on Essential Oils and Acupressure taught by Jeffrey Yuen. Jeffrey represents the 88th generation of the Daoist Jade School of Purity; it’s roots extend to the origins of Chinese Medicine. I then attended a seminar with Jeffrey a few months later on the treatment of mental and emotional disorders with essential oils. In addition to learning some great information about essential oils, a lot of classical concepts were discussed in great detail. I discovered that I had much to learn about Chinese Medicine. This led me to entering a PhD program in Classical Chinese Medicine at the American University of Complementary Medicine. The program is based on the deep teachings of Jeffrey Yuen. I have been studying in the program since 2012. I have learned a great deal and am excited to share with you all. 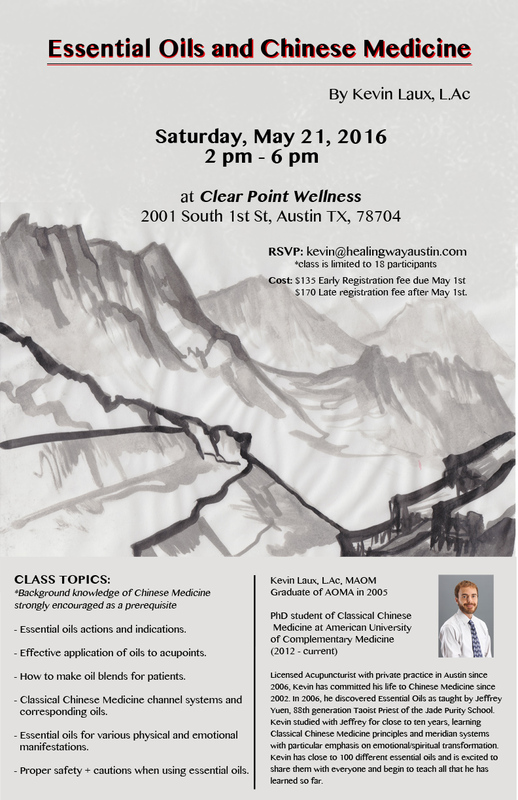 As some of my favorite teachers have said, almost no one will reach mastery level of Chinese Medicine in one lifetime; there is too much depth to take in. With that in mind, I welcome you to join me in the journey of deepening knowledge.